“Laugh Working” a hoot of a success! Yes, that’s Chicago native, Pat McGann, part of the Chicago Comedy All-Stars featured at the Tuesday, November 14th inaugural “Laugh Working”. What a great event departure for LifeWorking Coworking! 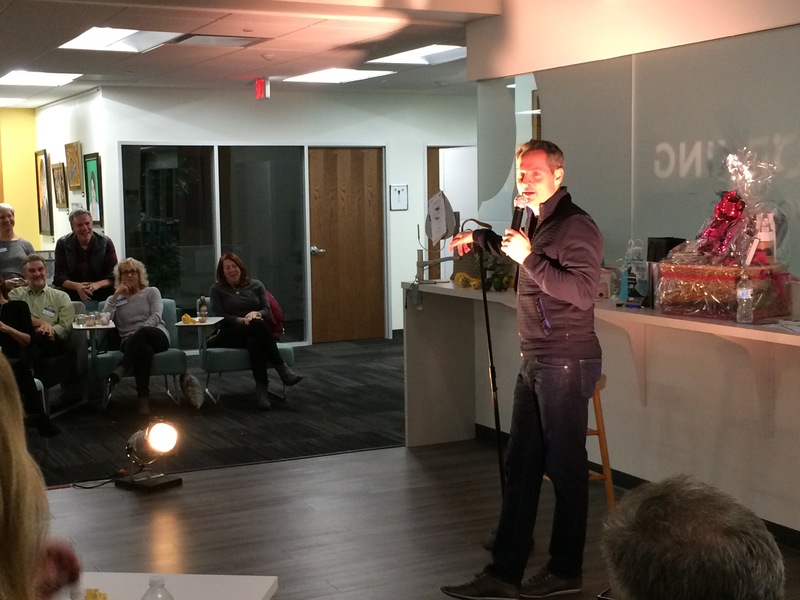 “Laugh Working” was an evening of comedy and “Guffaws for a Cause” – benefiting the American Cancer Society. Our comedians included Rick Young, Jimmy McHugh and Pat McGann. Our sponsors enjoyed the VIP pre-event reception, followed by libations, light appetizers and lots of laughter. The All-Stars kept the event fun and engaging. We raffled off 6 separate items, including a Cooper’s Hawk “Evening in Tuscany gift basket, Spa gift basket, and a Williams-Sonoma BBQ gift basket. Our very own Kathleen Weinstein raffled off a discounted portrait package and donated the purchase price back to the American Cancer Society. Vestor Capital, First Bank and Trust, SITE REsolutions, Fujinan, Kathleen Weinstein Photography, Author Alexia Gordon. We look forward to featuring “LaughWorking/Guffaws for a Cause” again in February – let the Laughs flow!